San Salvador, El Salvador – Salvador Sanchez Ceren, Marxist leader, former guerrilla commander, teacher and trade unionist, won the March 9 presidential run-off elections by a narrow 6634 votes of the nearly 3 million cast, over the right-wing candidate, Norman Quijano. Voters turned out in record numbers. 63% of the eligible population voted, and though the margin was narrow, Ceren’s 1.4 million votes were greater than any other president received in the history of the country. Sanchez Ceren is a leader of the left-wing Farabundo Marti National Liberation Front (FMLN), while Quijano is the candidate of the right-wing Nationalist Republican Alliance (ARENA) party. El Salvador is still deeply polarized 22 years after the end of the country’s civil war that pitted FMLN rebels against ARENA’s right-wing military rule. As the Salvadoran National Electoral Authority (TSE) worked to verify the final vote count that showed the FMLN winning, members of ARENA took a slew of actions to delay the process and ultimately tried to nullify the process as a whole. Charging the TSE with fraud on election day but not publicizing any evidence, ARENA walked out halfway through the final count, only returning after the TSE said they would continue the count with or without ARENA’s participation. This followed inflammatory remarks issued by ARENA candidate Norman Quijano late on election day, in which he declared victory before the initial vote count was even completed, implored his party faithful to not “allow this victory to be stolen from us like it was in Venezuela” and to “prepare for war.” He further called upon the Salvadoran army to intervene in the nation’s politics and impose him as victor in spite of the official vote count showing him losing. This would have basically amounted to a coup. Quijano’s call for the military to intervene and impose his victory resulted in a tense situation for a country still recovering from the ravages of a bloody civil war that ended in 1992, in which the army was used as a brutal repressive force against popular movements and the left. Given the history of military repression in the country, many breathed a sigh of relief when the defense minister and military leaders held a press conference midweek to affirm their chain of command and to denounce efforts to manipulate the armed forces. Reports from thousands of national and international observers contradicted ARENA’s claims of fraud and instead congratulated Salvadoran voters and electoral authorities for conducting a transparent and efficient process. The United Nations, the Organization of American States and the U.S. State Department all echoed observers’ assessment of the elections as clean and fair. Many organizations that have observed all the Salvadoran elections since the 1992 peace accords stated that this was the most transparent election they have seen here, with several new anti-fraud and transparency measures implemented for the first time. Late on Sunday, March 16, the TSE certified the elections and officially declared Salvador Sanchez Ceren the president-elect. 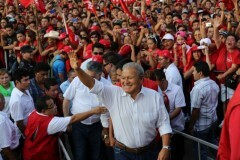 On Saturday, March 15, a week after the election, hundreds of thousands of FMLN supporters rallied to celebrate and defend the FMLN election victory. Meanwhile ARENA party faithful continue to protest the election results and call for the elections to be annulled. Their actions appear to be taking a page out of the Venezuelan right wing’s destabilization playbook. It comes as no surprise that JJ Rendon, former campaign manager for Venezuelan right-wing opposition candidate Henrique Capriles, was hired by ARENA to run their flagging electoral campaign last year. The cries of fraud in El Salvador echoed Capriles’s cries of fraud when he lost last year’s election in Venezuela against leftist Nicolas Maduro, despite international observers certifying the election as clean in both cases. ARENA’s campaign focused on fomenting fear that if the FMLN won, El Salvador would become the “next Venezuela.” This drumbeat of fear was ramped up to a fevered pitch in the last few weeks before the March 9 runoff election. The right wing used their control of mass media to bombard people with the message that Venezuela means “chaos and violence.” They saturated the media with ads from the Nationalist Republican Youth playing ominous music over footage of snipers and street violence. This has an impact in a country like El Salvador with a recent civil war and high rates of ongoing street violence. Fear mongering and a massive infusion of campaign funds from ANEP, the National Association of Private Enterprise, raised the turnout for ARENA in the second round runoff election, but it was not enough to deliver the victory that the right wing hoped for. Instead. the Salvadoran people elected a left-wing former guerrilla commander who is openly allied with Venezuela, Cuba and socialists around the world, to be the commander in chief of El Salvador. The close results in the March 9 runoff election were a surprise for many, as Sanchez Ceren beat Quijano by 10 points in the first round election in February, but fell just short of the 50%-plus-1 needed to win without a runoff between the top two parties. In polls right before the March 9 runoff election, Sanchez Ceren held a commanding 10 to 15% lead over Quijano. However, in the first round, the right wing was divided between two candidates, ARENA’s Quijano and the Grand Alliance for National Unity’s (GANA) Tony Saca. GANA was formed in a recent acrimonious split from ARENA. Their candidate Tony Saca was president of El Salvador for ARENA from 2004-2009. GANA received nearly 10% of the vote in the first round election in February. Some assumed, incorrectly, that because GANA split so recently from ARENA that their supporters may lean toward the FMLN in the runoff election. But El Salvador is a country deeply polarized between left and right with virtually no political center. It seems likely that people who voted for GANA in the first round shifted their vote to the other right-wing party, ARENA, in the second round, contributing to the runoff election being closer than most had predicted. ARENA ruled El Salvador from 1989 to 2009, and its roots are in the right-wing death squads during El Salvador’s civil war. Its founder was Roberto D’Aubuisson, responsible for ordering Archbishop Romero’s assassination in 1980, and founder of the notorious right-wing death squads. In 20 years of governance, they implemented devastating neoliberal programs, including privatization of key services and the conversion of the economy to the U.S. dollar, which leaves the country tied to the ebbs and flows of the U.S. economy. During their terms in office, ARENA was also wracked with multiple corruption scandals. For example Francisco Flores, El Salvador’s president from 1999-2004 is being investigated by numerous agencies, including the U.S. Internal Revenue Service for the disappearance of over $10 million of Taiwanese development funds during his administration. The FMLN, on the other hand, voices their commitment to a socialist vision for El Salvador, though their ability to implement that vision has been and will continue to be limited by severe resistance from the rich and the right wing of the country, the lack of productive and natural resources, and pressure from international funding sources. The FMLN has held the presidency of El Salvador since 2009, but the current president, Mauricio Funes, is not a party member and the FMLN has had to govern in a sort of coalition, dividing up positions with Funes’s more moderate forces. So since 2009 the FMLN has focused their efforts on smaller social reforms that have been widely popular, and were largely responsible for the FMLN winning the rural vote that had been voting for ARENA for the past decade. They brought free health care to neglected areas of the countryside; eliminated the ‘voluntary’ fees for health care and schools; and issued land titles to small farmers that were first promised during the 1992 peace accords. FMLN President-elect Sanchez Ceren served as the Minister of Education in the Funes administration and oversaw the most popular of the programs, the Paquete Escolar, or School Packet, program that provides every public school student with supplies, uniforms and a daily meal, all for free. The health and education programs have had a particularly profound impact on women and girls, who are often left behind when families are forced to pay for education. The FMLN also instituted a number of significant labor policies, including full legal recognition of public sector unions and granting full protection to domestic workers, which benefits upwards of 80,000 women housekeepers, nannies and cooks who have often been working in slave-like conditions. The Salvadoran right-wing is hell-bent on preventing even modest reforms from being instituted and will continue its destabilization efforts. The U.S. government has stated that they will work with an FMLN government, but history has shown that they will work to undermine and prevent real reforms that alter existing relations of power from moving forward. The need for solidarity with the FMLN, the labor and social movement and the Salvadoran people will be great in the coming period as they build an alternative vision – one that isn’t based on capitalism – for their country. Cherrene Horazuk is the president of AFSCME Local 3800, the union of clerical workers at the University of Minnesota, and the former Executive Director of CISPES, the Committee in Solidarity with the People of El Salvador. She was an accredited observer of the March 9 presidential elections, and has been observing El Salvador’s elections since 1994.